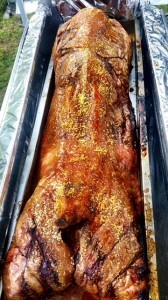 Hog Roast Redruth for an Engagement Party on the Beach! Having spent their whole lives living on the coast, self-confessed ‘beach bums’ Ryan and Clare had first met during a surfing lesson 3 years ago and through their mutual love of all things aquatic, their love for each other had also blossomed. So when Ryan popped the question, an engagement party on the beach was the perfect way for them to celebrate their impeding nuptials! Whilst it only took about five seconds for them to decide on the location, finding a catering company who could cook on the shore but still provide the same high-quality dining experience as a hotel restaurant, was another matter entirely. For a while they thought they were going to have to get their trusty barbeque out (which had served them well over the years) and do it themselves, but just in time, Clare managed to stop Ryan from trying to dismantle the cumbersome contraption so it would fit in the car, when she chanced upon one of Hog Roast Redruth’s reviews! Caterers who can cook anything, anywhere, who are also excellent value for money? She thought it was too good to be true until a quick phone call to our customer service team confirmed it! With the menu selected and the date booked (after wisely checking the tide times! ), one of our awesome Hog Roast Redruth chefs and creative catering assistants were proudly bestowed as honorary beach bums for the day and were dispatched to set up our mobile kitchen on the beach where Ryan and Clare first met! Unlike Ryan when he was trying to wrestle his barbeque into the car, we had no issues whatsoever in transporting our compact and versatile Hogmaster machine to their chosen location. Whatever the location or terrain, we can get there, we can cook there, and we always deliver the same amazing results! The happy coastal couple and their 40 guests certainly agreed-they all loved the delicate slow-roasted pork and marvelled at how our catering assistant had also prepared all the accompanying side salads, coleslaw and potato wedges on the beach as well! It was the perfect way to celebrate the beach-loving couples happy news and as Hog Roast Redruth had well and truly passed the cooking on the beach test, they have already enquired about our availability to cater for their wedding-which will also be taking place in the same sandy spot! Wedding Catering To Be Remembered! Hog Roast Buckfastleigh – A Bon Voyage Party!